Radiant Table: Boursin Shrimp over Zucchini "Pasta"
Boursin Shrimp over Zucchini "Pasta"
With all the summer squash around, we have been making this zucchini "pasta" a lot, with varied toppings. This is so quick to put together and the fresh zucchini really gives this "pasta' flavor. 3 ounces Boursin garlic and fine herb cheese, at room temp. In a large saute pan, over medium heat, add onion to olive oil and cook until softened. Add peppers and cook about 2 minutes. Add Boursin cheese to mixture, stirring until melted. Stir in the zucchini, salt and pepper to the "sauce." Adding water as needed to thin. Cook about 2 minutes. Remove from heat. 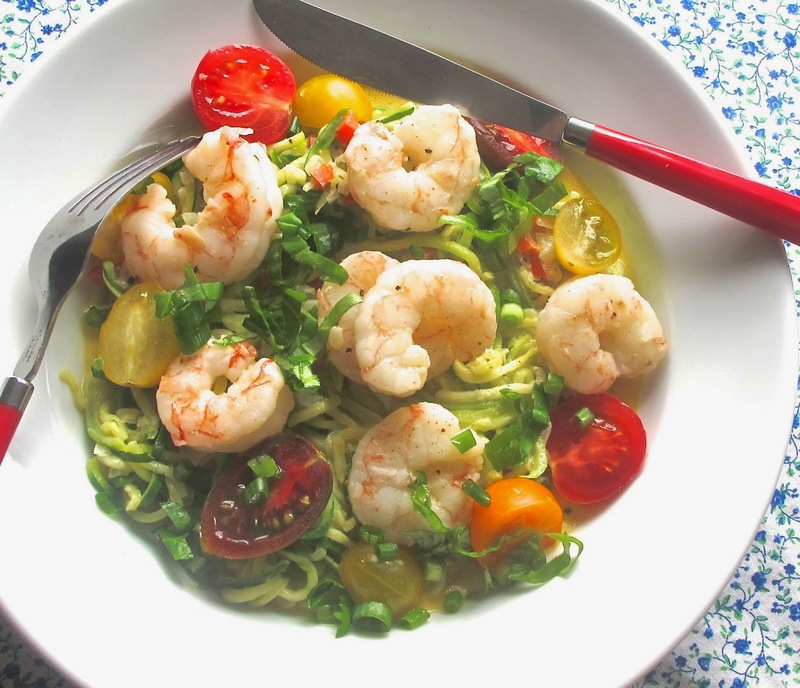 Divide into two serving bowls, top with shrimp, tomatoes, green onion, and basil. Place raw shrimp on a foil lined baking sheet, toss with 1 Tablespoon olive oil, and sprinkle with salt and pepper. Place in a 400F oven and roast until cooked, about 5-8 minutes. Squeeze a 1/2 lemon over shrimp and serve.